In a previous article, I described how to start building a reliable recall. Practicing many easy trials using exciting rewards and a finger-target your dog can touch with his nose will create a strong foundation for this essential behavior. To achieve a response from your dog that’s dependable in the midst of real-life distractions, though, you’ll need to invest more training effort. I am proud of Lisa. Reba’s immediate response wasn’t good luck; it was the result of Lisa’s commitment to conduct regular training sessions designed to teach Reba to run to her despite huge temptations to do otherwise. Come when I call you, even if you’re having fun playing. Come when I call you, even if you’re running away at full speed. Sometimes, “come” ends your dog’s fun. You may need to call him away from his friends at the dog park or out of your fenced yard so you can put him inside his crate. These consequences are examples of negative punishment, (i.e., the removal of something your dog enjoys) and they will quickly teach your dog not to come when you call. You can avoid this problem by using the “catch & release” method. Call your dog to come to you when he is mildly interested in his surroundings. Then reward his correct response with food treats and praise AND with the opportunity to go back to what he was doing. Don’t worry if his recall is slow or hesitant. With a click or the word “Yes,” mark the instant he does touch your outstretched fingers. Follow this with the triple reward of food + praise + release. We used catch & release when I trained dolphins for the US Navy. These dolphins worked in the open ocean beside small motorboats that carried the trainers. At the end of every session, each dolphin had to jump into the boat (onto a specially designed mat) for the ride back to their home pens at the Navy base. This behavior, called “beaching,” was critical. It was also illogical. How could we possibly train free-swimming dolphins to jump voluntarily into a boat to be transported back to captivity? We did it by signaling them to jump into the boat many times during a training session. Usually, we would reward this behavior by feeding them a handful of smelt and then gently pushing them back into the ocean. These were “fake” trials in which the dolphin earned a generous food reward plus more “free” time. More numerous than real trials in which the dolphin stayed on-board, fake trials were part of a strategy designed to produce an enthusiastic response to the beaching cue. 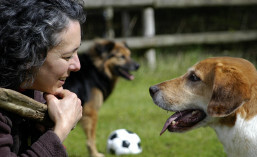 Dogs often fail to come when called because they haven’t been taught a crucial part of the correct behavior: the pivot. They may have experienced hundreds of repetitions of being rewarded for coming from a standing or sitting position. But they also need to rehearse the 180° pivot inherent in many everyday recalls (e.g., when your dog dashes out the front door or is chasing a squirrel). You can teach your dog this skill by creating a situation in which you motivate him to run away from you. You’ll need something he’ll chase – a piece of food or a toy – and an assistant. Throw the food or toy as far as you can and let your dog run to get it. Do this two or three times. Then throw the food or toy again but this time, call “Spot come!” the instant the object leaves your hand. If your dog turns and moves toward you, click or say “Yes.” Then feed him generously while lavishing him with praise. If your dog doesn’t turn and move toward you, have an assistant pick up the food or toy before your dog reaches it. Your assistant will have to get to it before your dog does, so use food that’s easily visible on the ground and toys that don’t roll. You may have to practice your aim beforehand, without the dog. Intersperse trials of calling your dog as soon as you throw the food or toy with trials in which you let the dog get the object. If you don’t alternate between recall trials and “get it/fetch” trials, your dog will simply stop chasing the thrown object. As your dog gets better at this game, begin to delay saying “Spot come” by a second or two. That is, let him get a bit closer to the coveted object before you call. The closer he is, the harder it will be for him to turn away from the temptation. Work up to calling when he’s only a few feet away from a thrown toy or piece of food. Also, you’ll be able to gradually fade your assistant out of the picture. Over time, your assistant should have fewer trials in which he has to grab the food or toy after your dog makes a mistake. With practice, you’ll have the thrill of watching your dog come away from certain danger. As Lisa said, this is more satisfying than any ribbon Reba has won in agility.